(Worldkings.org) If you're dirty and sweaty from performing an outdoor activity, it's understandable that you don't want to drive home that way. Wouldn't it be nice if you could take a hot shower first? 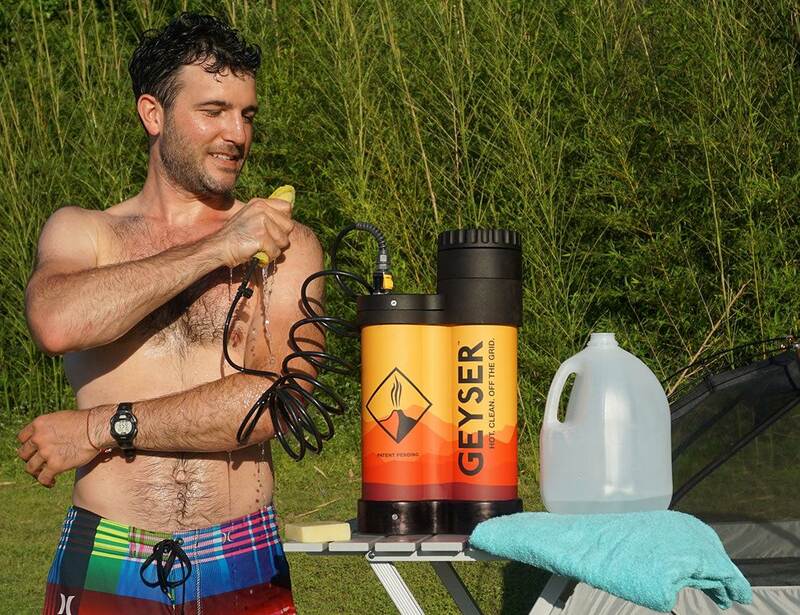 Well, the portable Geyser System lets you do so – depending on how you define the word "shower." First of all, there are already portable showers that allow outdoorsy types to clean up, although the ones we've seen heat their water either via the sun, or by being plugged into a portable generator. By contrast, the Geyser utilizes a built-in heating element that's powered by the user's car's 12-volt DC power supply. 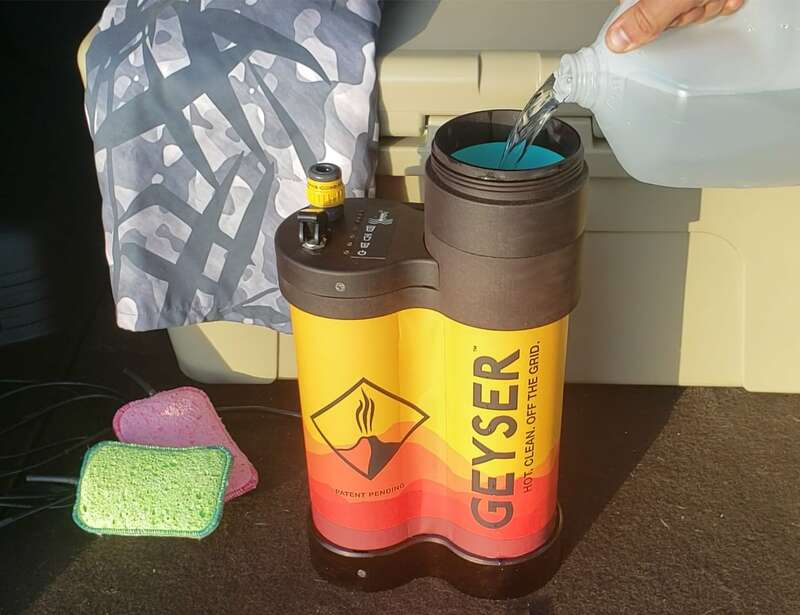 The user starts by adding one US gallon (3.8 l) of water to the Geyser, either before they head out or from an onsite source. They then plug the Geyser into their car's outlet, and switch on the element. Within a claimed 15 to 35 minutes, depending on the initial temperature of the water, it heats that water to 95 ºF (35 ºC). Once they're ready to get wet, the user then switches the Geyser over from Heat to Pump mode. This, appropriately enough, causes it to start pumping the heated water through its attached hose and into a sponge at the end, which is used for washing up. The rate at which it pumps can be varied from .06 to one gallon per minute. Three onboard thermostats regulate the water temperature, and let the user know when it's heated. There's also a water level sensor that provides a warning when the water's getting low, and then proceeds to switch off the heating element. Additionally, a lid sensor automatically shuts off the element if the lid isn't securely fastened. 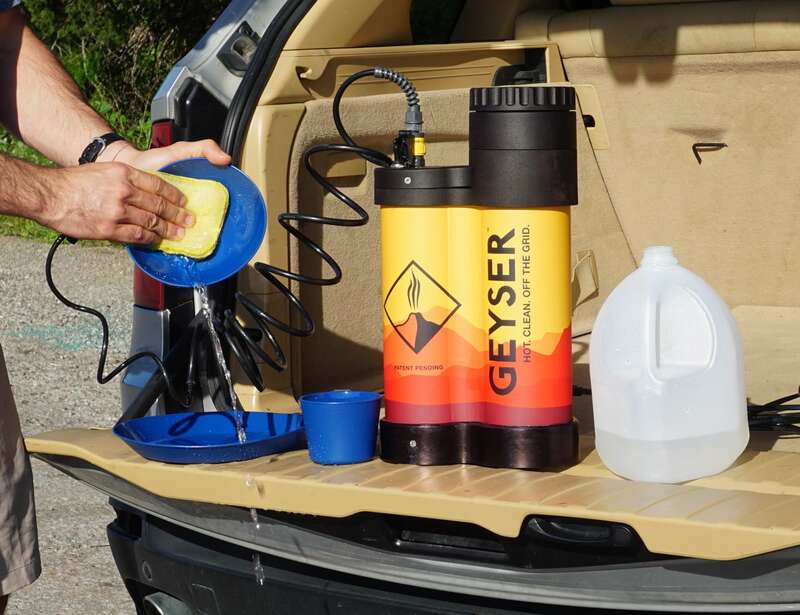 It should be noted that the Geyser doesn't have a battery, so it needs to remain plugged into the car or a separate deep cycle battery while operating. Also, in order to keep the car's battery from being drained, the vehicle needs to stay running while the water is being heated. 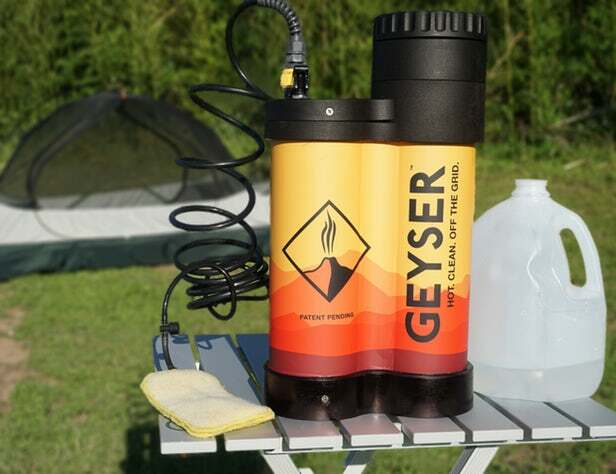 If you're interested in getting a Geyser System, it's currently the subject of a Kickstarter campaign. A pledge of US$195 will get you one with a single replacement sponge, with delivery estimated for next January if everything works out. The planned retail price is $295, with extra sponges going for $4.50 a pop – or less, if bought in multi-packs.